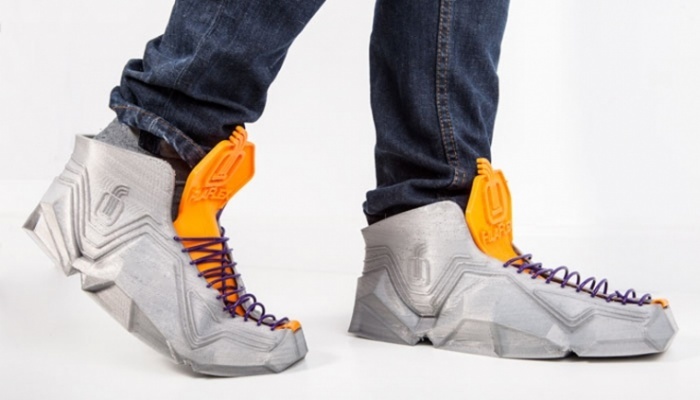 3D-Printed Sneakers are Flexible, Foldable, Durable | OhGizmo! By Hazel Chua on 03/19/14 • Leave a comment! “Prepare for the unexpected” is what they always say. While you can’t exactly prepare for every single thing, you could take a cue from past experiences to prepare for the inevitable. For example, if your friends have a habit of inviting you out at the last minute for a game of basketball, then it might be a good idea to keep a pair of sneakers in your car, right? If you don’t drive, then the Sneakerbot II is a good option. These 3D printed sneakers were inspired by Back to the Future and Star Wars, and it shows in its design, which was done by Recreus founder Ignacio Garcia. Using his company’s new Filaflex 1.75mm filament, the resulting 3D-printed sneakers can be bent and folded so you can just fold them up and throw them into your bag or briefcase. You can download the 3D files for the Sneaketbot II HERE.